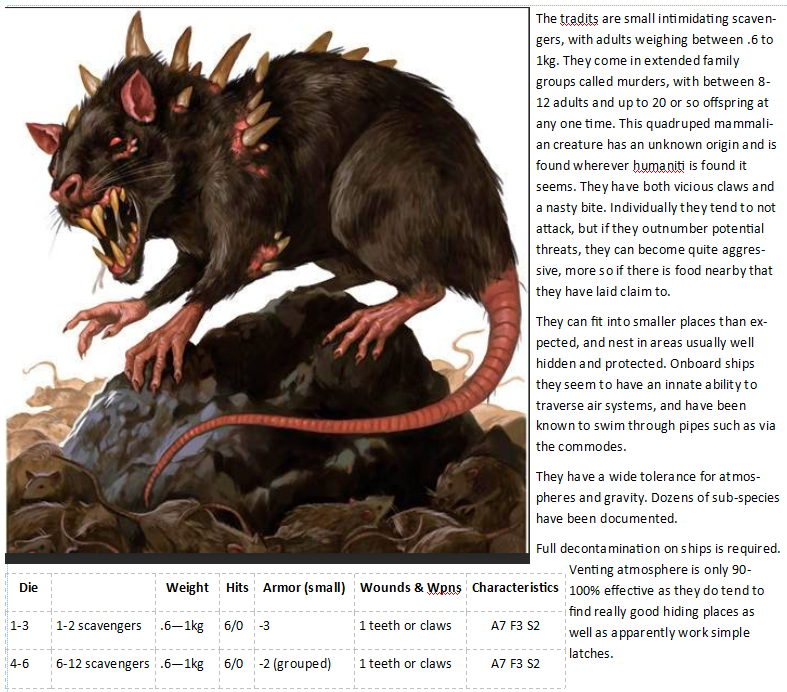 Okay, I believe the image is actually a dire rat, but it was an interesting image that will work for me. Not sure where I got it - although I am leaning towards a D&D site. Sorry I don't have the source link - blame my digital hoarding. Also - not much longer before G+ goes away (in a rat-like manner no less). I'll still be updating this blog for both the games I play as well as any software I write (one of these days I will get back to the Traveller Tracker, promise!) I post on COTI as coliver988 (I tend to be unimaginative with user names). I am not a Facebook user, nor will I join one of the now far too many other sites trying to keep some of the wonderful goodness we are losing with the demise of G+. And who knows when they may pull the plug on this as well: as per all big companies, you never know where they will go. I may have to eventually host stuff myself. And as most of the stuff I post here are copies of things I have anyway, I should be good to go no matter what. 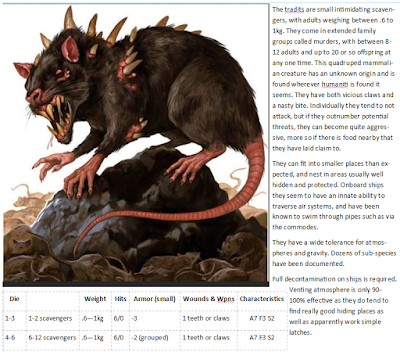 Regardless - here are the tradits, a mutated rat that infests everyplace that humanity has got to. My players shall be encountering a murder of them next session in all likelihood. A group of tradits is a murder, just like a group of crows.